By Phoebe Hinton-SheleyReviewed by Deepthi Sathyajith, M.Pharm. A pressure ulcer, otherwise known as a common ‘bedsore’, is a skin tissue injury caused by repeated pressure or friction. These injuries can usually be observed on a bony prominence and are most commonly seen in patients who are bedbound either due to age, illness, or a combination of the two. These factors usually prevent the patient from performing basic essential care required for their bodies, resulting in these ‘bedsores’. They are very painful for the patient, and severely reduce the quality of life, especially in those who are bedbound due to old age. A survey performed over five European countries showed an 18.1% prevalence of pressure ulcers among hospitalized patients in 2001 with the same survey in the United States of America giving a 15% prevalence. These injuries present themselves in varying stages of severity. 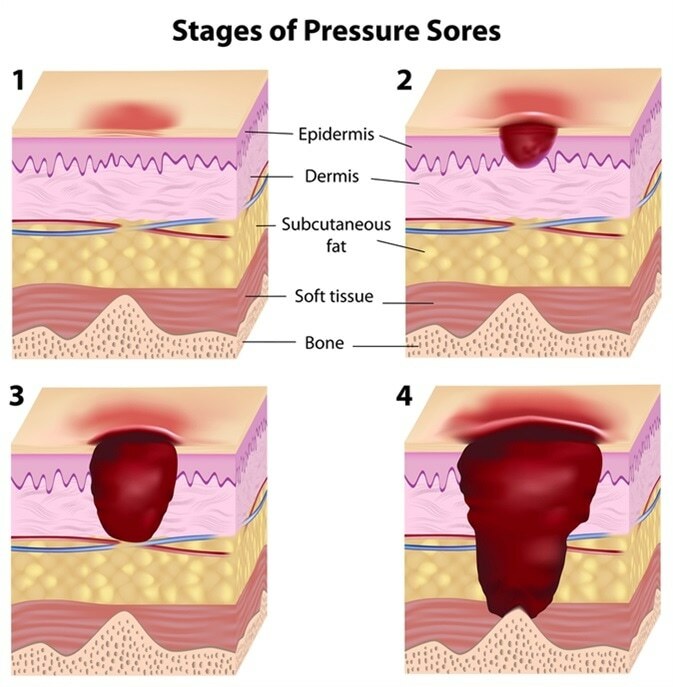 Stage I pressure ulcers consist of no skin breakage, but the presence of mild non-blanching hyperaemia (skin whiteness causes by a lack of blood-flow); Stage II pressure ulcers present a very shallow break in the skin, with slough (yellow, dying tissue surrounding the wound); Stage III pressure ulcers show full-thickness tissue loss that effect the sub-cutaneous layer (deep inside the skin tissue), with no tendon, muscle, or bone being exposed at this point; Stage IV pressure ulcer causes full-thickness tissue loss with necrotic tissue amongst the slough, as well as exposed bone, muscle, and/or tendon(s). Pressure ulcers do not necessarily progress through all of the stages nor do they heal in a backward direction of the stages (Stages IV – I). Modern treatments for pressure ulcers include general wound washing and dressing. Another method of healing these wounds includes the use of protein supplements – which can aid in the healing process. Also, radiant heat dressings can help improve wound healing time, as well as hydrocolloid dressings and electrical stimulation. Other, less orthodox methods of treating pressure ulcers include light therapies. These therapies utilise a beam of polarised light, directed at the pressure ulcer wound. A study performed in 2008 showed that, after four weeks of light therapy (as well as general wound washing and dressing), a group of 20 patients with pressure ulcers ranging from stage I to stage III displayed significant improvements in wound healing compared to just washing and dressing alone. As pressure ulcers can cause various issues (death, incurred costs of treatment, etc), many prevention methods have been put in place globally in an effort to prevent the formation of pressure ulcers. For example, in America, there are two types of scales used to predict the possibility of a pressure ulcer occurring on a patient. The Norton Scale uses a selection of five clinical factors to determine the probability of a pressure ulcer occurring: activity, mobility, mental state, incontinence, and physical condition. If a patient presents a score of 16 or less on this scale, it is predicted that there is an increase in risk of the patient in question developing a pressure ulcer. One of the most commonly used preventative measures is redistributing the weight/pressure on a patient’s body. This could include physically moving the patient, either out of the bed/seat entirely, or just changing position. This could also require specific bedding that can be altered to change pressure points, such as electronic beds that use air-flow valves and other mechanics to change the shape of the bed itself – thus, reducing pressure on specific parts of the body after a set amount of time (e.g. a 2-hour repositioning schedule). Different mattress overlays can also be used for patients which are at a lower risk of developing pressure ulcers – such as those made from foam or gel. These could also be used for people that spend extended amounts of time in bed/a seat, but who still have a certain amount of mobility for changing position if they feel the need to. Poor nutritional status is another independent risk factor that can lead to pressure ulcers. The European Society for Clinical Nutrition and Metabolism (ESPEN) and The American Society for Parenteral and Enteral Nutrition) have general recommendations for nutrition screening and assessment. Studies have suggested the use of high-protein nutritional supplements or tube feeding for individuals at risk of developing pressure ulcers especially due to a chronic or acute disease or after a surgical intervention. Although not all pressure ulcers are preventable, a vast majority can be avoided by having a comprehensive pressure ulcer prevention plan in place that will not only lessen the financial burden but will also relieve the patient of physical and psychological trauma. Pressure ulcer treatment strategies: a systematic comparative effectiveness review. The effects of polarized light therapy in pressure ulcer healing. Pressure ulcers - What are pressure ulcers (bedsores)? Phoebe Hinton-Sheley is currently studying for a Bachelor of Science (B.Sc.) degree in Microbiology at the University of Wolverhampton.